Meet your private English-speaking guide at the exit of your cruise terminal. The guide will hold your name sign for you to recognize. We first come to the old part of Shanghai and visit the beautiful Ming Dynasty garden-Yu Garden. Then stroll to the nearby Chenghuangmiao Bazzar for hunting some interesting local things. Transfer to the Shanghai Museum located in the People’s Square in the city center. It is a first-rate museum that focuses on ancient China arts. End today’s tour with a pleasant cruise along the Huangpu River, a nice way to see Shanghai’s historic Bund and the modern Pudong skyline. Today we will have an excursion tour to Suzhou, a beautiful city adjacent to Shanghai. 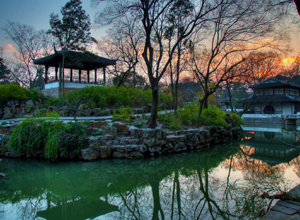 Suzhou is most famous for its outstanding classic Chinese style gardens, and we will visit two of its representative- Humble Administrators Garden, and Master of the Nets Garden. In the afternoon, drive to Zhouzhuang to visit the ancient Zhouzhuang Watertown, which is noted for its well preserved ancient residential houses, the elegant watery views and the strong local colored traditions and customs. Continue to visit the highlights attractions in the city. First, ascend the Oriental Pearl TV Tower. Standing on the world’s third tallest TV tower to have an amazing view of the city. Then visit the Jade Buddha Temple, an antique style Buddhist temple which could bring some peace in your heart. Come to Xintiandi, where you will find the perfect integration of traditional Shikumen houses with bars, restaurants, and stores. Finally, visit the premier Nanjing Road for shopping fun. Be transferred back to your cruise port after the tour.